Out from the niche – and into the marketplace. Eco brands are finding their way with increasing frequency onto the shop floor of the major department stores and into the ranges on offer in online shops, and competing amongst the conventional labels. There are many possibilities: Asos, Manufactum and Selfridges show how it can work. An exclusive article by Rebecca Espenschied. The German-Chinese label, LangerChen has been designing and producing women’s and men’s functional clothing since 2013. Miranda Chen and Philipp Langer have focused on functional jackets, which are manufactured in their own workshops just outside Shanghai. The basic idea behind their label is that textile production should not be a burden on either human beings or the environment. Contemporary design that is both ecologically and ethically defensible. At the Möon Berlin – Sustainable Clothing fashion store, both the shop layout and the selections on offer bear witness to very considerable creativity; with international brands such as Kowtow, People Tree and Studio Elsien Gringhuis. This is where we introduce personalities whose work has significantly impacted the eco-fashion sector. Three questions for Javier Goyeneche, President and Founder of the Ecoalf fashion label, which puts its faith entirely in recycled fibre and sources its materials in unusual ways. The protection of animals and nature – factory farming and chrome tanning. The demand for vegan and environmentally friendly alternatives to leather is growing. Piñatex, a leather substitute made from pineapple fibres has properties that are very similar to those of animal skin. The first shoe and handbag manufacturers are trialling the material. “Fashion. Innovative, desirable and responsibly produced.” Bruno Pieters’ words hit right at the heart of the core message presented by the two authors of the new book ‘Fashion Made Fair’, Magdalena Schaffrin and Ellen Köhrer. Their publication gives a portrait of 33 international designers and labels, who all interpret the subject in different ways. In addition, fashion experts explain various important aspects of sustainable fashion. 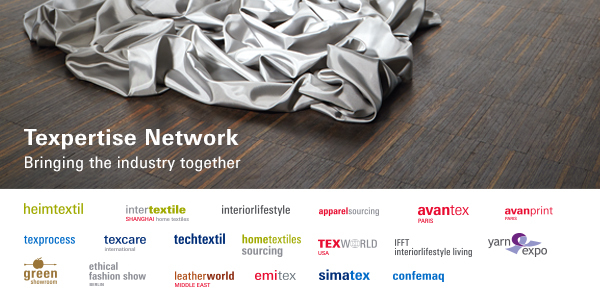 Copenhagen is set to become a global centre for textiles and sustainability – as the international congress, Planet Textiles, takes place there on 11 May 2016. At the one-day sustainability conference, buyers, retailers and decision-makers in the textile industry, as well as advisers from some of the leading brands, will meet together to discuss the latest developments in the sector. ‘Cutting waste out of fashion’ – this was the slogan of the young international designers at the Eco Chic Design Award. The annual competition is being organised for the fifth time by the international non-governmental organisation Redress. A double victory for Patrycja Guzik. For the fourth time, the ‘Young Creations Award: Upcycling’ was presented within the framework of Heimtextil. Five young designers from Italy, Great Britain and Germany were rewarded for their innovative designs. Read more news and information about textiles and sustainability. Take part in the discussion and help shape the development of subjects that are important to you.